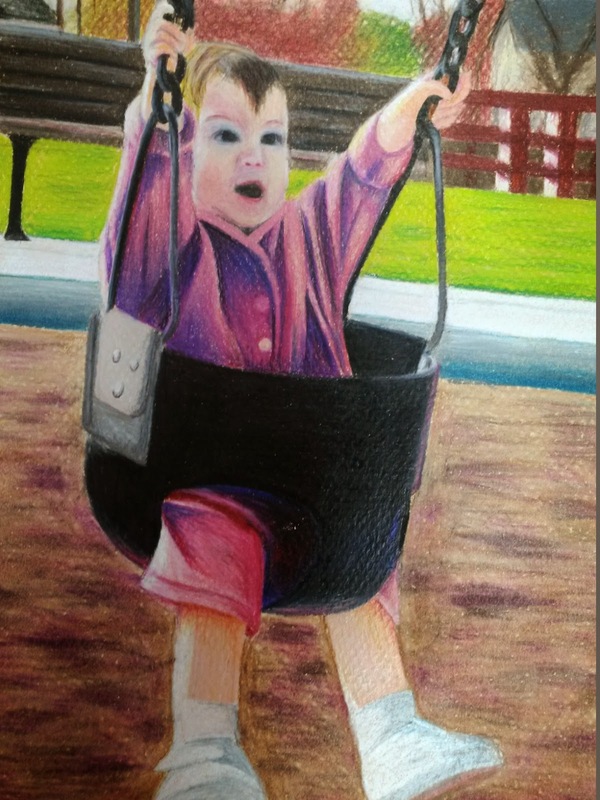 For my self- portrait I chose to draw myself from when I was little and found this picture of me in a swing. I really liked the composition and the colors throughout the image. I decided to draw this in Prismacolors so that I could capture all of the bright colors and textures. My favorite part of the drawing is the jacket because I really enjoyed drawing all the folds in the fabric and using the different pinks and purples for the various values. One section that was hard for me was the bark in the background because of the many lights and darks. The fact that it was slightly blurred also made it hard because I was trying to capture all the colors without taking away from me in the swing. The shoes were also difficult because the only values present were white and gray, it was hard to really make it look like shoes with only two values. The face was my hardest section to draw because I don't really like drawing facial features and it was hard to get all the proportions correct. Eventually I got the face sized right and now I really like it because it actually looks accurate to the picture. I also really enjoyed putting in all the highlights on the face, legs, shoes, and the jacket. I always love how simple splashes of white that represent the areas being light up by the sun make the drawing look so much more realistic.